For a few years I used the model railroad software program for train operation called Ship-It! by Albion Software (http://www.albionsoftware.com). I reverted to "Car Cards" for awhile and am using the free jmri operations software on my new layout. It is similar to Ship-it. Here's some background and my experience with Ship-It should you be considering choosing it. Ship It! automates the process of generating operating sessions and removes the labor intensive writing of waybills. It is not just a random car movement generator. It is designed to function like the real world: shippers request empty cars of a specific type to send products to industry consignees who have ordered product. Loads and empties are routed across divisions via interchange trackage. Hidden and fiddle staging are supported. Both loads and empties are scheduled. Cars move on scheduled trains. Car lading and location are tracked through time. Everything in the database can be printed. 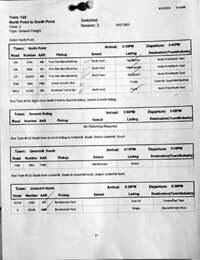 Switchlists can be printed as condensed or full with Conductor and Engineer instructions. Databases can be exported to Car Cards or an inventory program called Railbase Professional. These are just a few of the features. I used the computer printouts instead of car cards. This is a typical Ship-It switchlist. These scans aren't very clear. If you go to the Albion website there are samples of the forms you may review. The program's switchlist and database reports can be very detailed. Ship-It uses random generation to create the switchlists based on the parameters you set. You also have to make sure that there's a train that will go to the town or city where the industry is located. You can also set it up so trains can pick up in both directions or only one direction to avoid runarounds. There all kinds of wrinkles you can add. You can assign specific locomotives and vans (cabooses). You can run passenger trains, through trains, local freights and trains in and out of staging. Here's a close-up of that same switchlist with pickups and setouts ticked off. 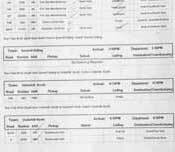 After the car's reporting marks and numbers is a column for pickups followed by set-outs and car lading. There is one farther column to the right showing final destination. This could be by another train depending on where the car is going at this time in this train's schedule. I recommend this program as a good way to start operations on your layout. It does require you to look at the reporting marks and numbers on cars. During a recent Northeastern Region Convention (NER) one modeler working in N scale found it difficult to see the small numbers. He decided to move his cars as blocks to avoid hunting for individual cars. I have about 200 freight cars in my database. After awhile my operators get to associate numbers with particular cars which makes it easier to track them down in a yard or at an industry. There are a number of database reports available as well as reports to help debug your system to make it function better. I'll admit that there is a learning curve. The instructions are very easy to follow. If you are already a Ship-It owner I also recommend that you buy Jean Piquette's Deluxe Balancer model railroad software program. This is where i had the most problems with Ship-It. This is a companion piece that helps you organize your database and balance the cars you have against the industries' needs. I suggest you start with a few cars and a few industries. Jean has been working with this program for a long time and is extremely knowledgeable and helpful. Check it out at http://mysiteverizon.net/vzeoIlq4. There is also a Chat group on the Internet to help with the program and all aspects of prototype and model train movement. After you get everything working and have some friends over to play with the trains, you can introduce a Fast Clock to operate your layout in scale time. This really adds some interesting complications. Because I was having trouble balancing the cars/industry mix I moved away from Ship-it to physical car cards. On my new UNRR model railroad I am using the free jmri software that in many ways is similar to Ship-it. There is also another program called Rail Ops, but I have never operated with it on anyone's layout. Return from "Ship-It" to my Home Page.